In our part 1 review of the Samsung Galaxy S 4 (SGS4) I noted that the device included a BCM2079x NFC controller. This is the same controller as we’ve seen in a number of other phones, including the Nexus 4, and is emerging as a popular second to the relatively ubiquitous NXP PN544 controller. When I saw the presence of BCM2079x, I remembered that this reader doesn’t read MIFARE tags, which the NXP solution does, since it is an NXP tag format. Instead Broadcom only reads tags which adhere to the standard NFC Forum tag types. Ordinarily this isn’t much of a problem, as long as users are aware of the limitation and to stay away from MIFARE classic tags on an incompatible reader. What’s interesting here is that Samsung’s TecTiles were themselves originally MIFARE Classic 1k tags, which makes them not compatible with the new SGS4. I then confirmed that the SGS4 does in fact not read my existing TecTiles which I’ve setup around the house. I reached out to Samsung, who issued a statement about TecTile compatibility on the SGS4 by announcing TecTile 2, which ostensibly carries a different tag inside compatible with the SGS4. "Samsung is introducing TecTile 2, an update to the original TecTile NFC programmable tags, which will be available in the coming weeks. 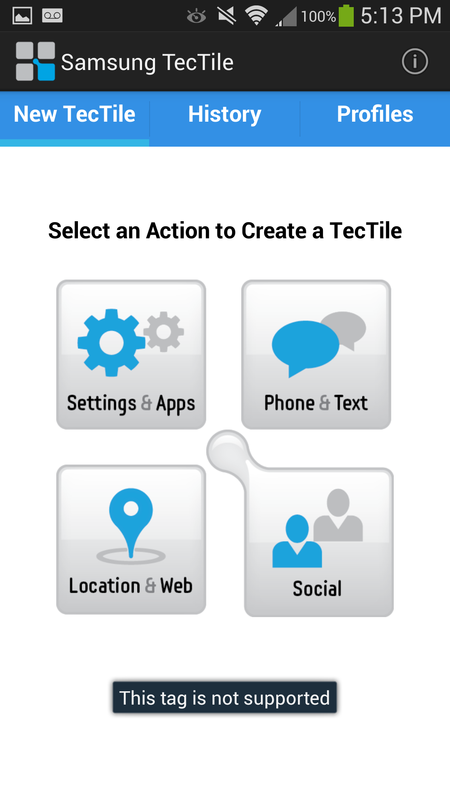 TecTile 2 will use the current NFC technology on the market, allowing Samsung customers to further incorporate NFC into their daily lives and to use with the latest Samsung Mobile products and services, including the Galaxy S 4. As industry standards continue to evolve, Samsung remains committed to meeting those standards and adapting its technologies if necessary. Samsung customers can also fully utilize TecTiles 2 with existing Samsung Mobile NFC-enabled Android smartphones currently in market." Interestingly enough some newer generation TecTiles not marked as TecTile 2 seem to have already made their way out onto the market. Several users replied on twitter that they’ve seen TecTiles which identify as an NFC Forum Type 4 tag instead of the MIFARE 1k tag, with a visually different appearance as well. If you’ve already got TecTiles that aren’t MIFARE, it seems that you’re in luck, otherwise if you’re upgrading to an SGS4 from another Samsung device and made use of TecTiles, it’s likely you’ll have to replace your NFC tags. It is perfect to use GS4 with this to add extenal storage!!! Hmmm... Apple introduces new iPhone and a new port. Old chargers are now incompatible. Samsung releases new Galaxy phone. Old NFC tags are now incompatible. Maybe this is just me, but I think that's a ridiculous parallel to make. 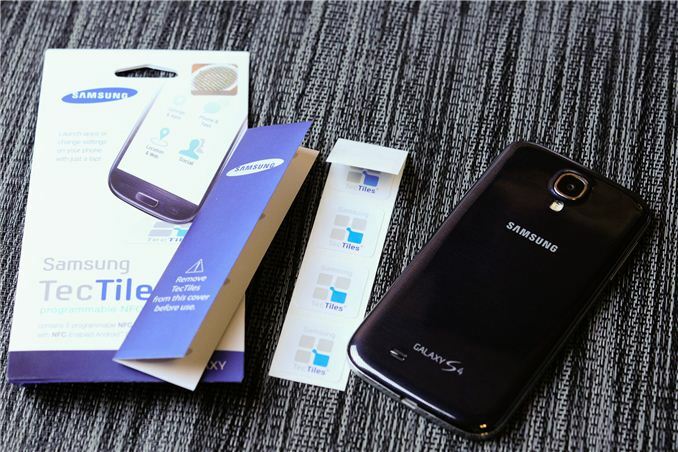 This is Samsung moving from a proprietary nfc tag version (from MIFARE) to a standard version. With Apple, you moved from a proprietary connector to another proprietary connector. "Far better and more modern"? You obviously have not read up on this POS. It has no audio line out. Its video output is heavily compressed, artifact-riddled garbage of LOWER resolution than the old dock connector's. And I wouldn't be surprised if the audio stream (which of course you need yet another bulky dongle to decode) were compressed also.